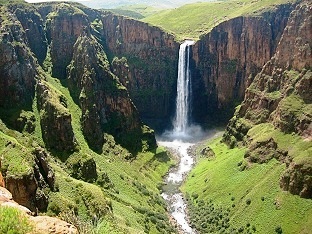 Lesotho, a landlocked country in Southern Africa is an enclave entirely surrounded by the Republic of South Africa with a total land area of 11,583 square miles and a population of over 2.06 Million. Lesotho faces high unemployment, economic collapse, a weak currency and serious health issues. The major sectors of its economy are diamonds and water exports, agriculture and livestock. In-spite of these resources, it is among the poorest countries of the world. Lesotho: Southbound Pocket Guide 978-1920143268 $16 The first travel guide to Lesotho, ideal for visitors who want to go off the beaten path. Covers history, sights, and details on accommodation and food. Lesotho Travel Reference Map by ITM Canada 978-1553412953 $12 1:350,000 Scale. The first stamps of Lesotho were a set of four stamps released on October 4, 1966 to mark Lesotho’s Independence achieved on the same day. The set (Scott #1 to #4) catalogs for around a dollar MNH or used. The design shows portraits of Moshoeshoe I and Moshoeshoe II. Moshoeshoe I was the king responsible for establishing the area comprising of present day Lesotho (Basutoland at the time) as a single polity in 1822. As a national hero, the day of Moshoeshoe’s death (March 11) is a national holiday in Lesotho. Moshoeshoe II was the paramount chief of Lesotho from 1960 until independence in 1966. He was King of Lesotho from 1966 until his death in 1996. This set was followed by a couple of sets that were ‘Lesotho’ overprints on issues with the ‘Basutoland’ inscription. Those sets (Scott #5 to #14 and #15 to #20) are both inexpensive and catalog for less than $10. A set of five stamps released on January 5, 1970 in the Prehistoric Reptile Footprints of Moyeni theme. The set (Scott #75 to #79) catalogs for around $10 MNH and around $7 used. The designs show dinosaur, gryponyx, plateosauravus, tritylodon, and massospondylus along with their footprints. Moyeni footprints are a series of over 250 footprints of reptiles from the Jurassic Period discovered in the 1960s and 1970s by French paleontologist Paul Ellenberger. A couple of other sets in the same theme include the Dinosaurs set of 1992 (Scott #907 to #916) and the Footprints set of 1984 (Scott #445 to #447). A set of five stamps released on April 25, 1977 showing Fauna. The set (Scott #228 to #232) catalogs for around $70 MNH and $10 used. The designs show rock rabbits, porcupine, polecat, klipspringers, and baboons. Fauna is a common theme among Lesotho issues and form a good collectible theme. Interesting sets include Birds (Scott #105 to #111, #618 to #632, #726 to #730), Butterflies (Scott #140 to #146), Fish (Scott #237 to #240), Reptiles (Scott #270 to #273), Chacma Baboons (Scott #351 to #356), Rock Pigeons (Scott #321 to #334), Indigenous Animals (Scott #459 to #463), African Monarch Butterflies (Scott #421 to #436), etc. A set of eight stamps and a souvenir sheet released on June 20, 1991 in the Entertainers in Films about Africa theme. The set (Scott #817 to #824 and #825) catalogs for around $12 MNH or used. The designs show Stewart Granger from King Solomon’s Mines, Johny Weissmuller from Tarzan the Ape Man, Clark Gable and Grace Kelly in Mogambo, Sigourney Weaver in Gorillas in the Mist, Humphrey Bogart and Catherine Hepburn in The African Queen, John Wayne in Hatari, Meryl Streep in Out of Africa, Eddie Murphy and Arsenio Hall Coming to America, and Elsa in Born Free. The first coins of Lesotho were Silver Licentes (100 Licente/Lisente = 1 Maloti/Loti) released in 1966. The proofs in low mintage (5K) is valued remarkably low at around $6. Gold Coin Proofs in low mintage were first issued the same year and showed a native bust in Obverse and Arms with supporters above value flanked by stars in Reverse. Gold proofs generally catalog at a slight premium over bullion value. Coins $2 and up Recent UNCs start around $2. Low mintage UNCs start around $10. Silver Proofs from the 1980s onward start around $50. Independence Set, Early Year Sets, etc go well into the 100s. Certain gold and platinum coins go well into the 100s and 1000s. Paper Money $2 and up Common UNCs starts around $2. Replacement Notes in UNC, High Value UNCs, etc start around $10. Rare Dates, and other scarce notes go well into the 100s.